Flocked Sponge is a sponge with a nap that glides across the skin. 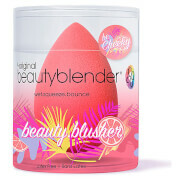 This product applies and blends minerals like no other sponge. This non-latex sponge is washable and will last for a long time. Use for stippling extra powder onto skin where needed. Always brush down. This is the way the hairs grow on the face. 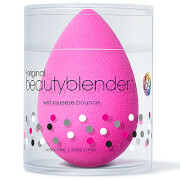 Use for blending and removing any excess. Spritz with D2O, Balance or POMMISST and use as a quick makeup remover. Wash sponge frequently. This sponge is the best! If you use Illuminare Cosmetics foundations, this is way better than their applicator...plus, it's half the cost! It also lasts months and months longer (maybe about year). You can use each corner at a time, meaning you can use one sponge for four applications before having to wash. Please give it a try, you will love it! Can not live without this sponge! This is the best sponge I have ever used. Never any fibers left behind on my face, like all other sponges I have used. Washes up like new. I liked it so well I bought another. Would recommend to anyone who wears makeup.